Have you ever wondered why most people who block and stutter do not stammer every time they speak? Indeed, most people who stammer are consistently fluent in certain contexts. When by themselves, speaking to a pet or speaking to a person with whom they are comfortable they speak fluently. This has been a puzzle for people who stammer and for speech pathologists for many years. Now the puzzle has finally been solved by this outstanding new book which details a completely new approach to treating this debilitating condition. Bob Bodenhamer explains that this phenomenon results from the thinking (cognition) of the stutter as he or she associates speaking with a lot of fear and anxiety about blocking. Most blocking is no more than a panic attack expressed in the muscles that control breathing and speaking. This book both explains the structure of blocking and provides the tools for gaining more fluency. One evening a while ago I received an email from my friend Professor Judith Kuster, who is webmaster for the Stuttering Home Page at Mankato State University. There was no way I could pass up this challenge. I dropped everything and started wrestling with the puzzle. Now, I pride myself on having a mind that can grasp numbers, even if I can never get my checkbook to balance. I tried everything to make it work. I looked for hidden numerical sequences. I tried dividing numbers by other numbers. I tried multiplying them. I looked for exotic progressions. I wrestled with this conundrum on and off for the better part of two days. No luck. I just couldn’t get those numbers to unlock their secret. It was so simple. Why couldn’t I think of that? I couldn’t think of it because I was stuck in a traditional way of approaching number puzzles. I had made certain unconscious assumptions about how the problem needed to be addressed. I did not know that I had limited my solutions. But the model within which I was working automatically ruled out non-numerical solutions. This same habit of thinking “inside the box” explains why for the 80 years since the birth of speech pathology, most people have not been able to solve the mystery of stuttering. Our paradigm, or model, of stuttering has forced us to look at the problem through a set of filters that have masked out relevant information and issues. In short, for 80 years, stuttering has been incorrectly characterized, and as a result, most of us have been trying to solve the wrong problem. I was lucky in that I never went through traditional speech therapy. So my vision was not colored by other people’s ideas of what stuttering was all about. Consequently, I ended up foraging on my own for answers, and by the age of 30, I had a different picture of stuttering than virtually anybody else I knew. I had also fully recovered, and this recovery has held for more than 35 years. What I discovered during my recovery process was that my stuttering was not a speech problem per se, but a problem with my experience of communicating to others. That was why I never stuttered when I was alone. I was not communicating with anyone. I also learned that my stuttering not only involved my speech, but all of me, and that included my emotions, perceptions, beliefs, intentions, and physiological responses. These elements were joined together in a spider-like web of interconnections, where a change at any point caused a change at all the other points. In short, I had to look at stuttering as an interactive, dynamic, self-sustaining system. If I wanted to achieve a lasting recovery, I had to address, not just my speech, but the entire system. An important part of this system was the way I thought about stuttering and about myself. Early in the recovery process, I began to question my way of seeing things. Was the world really such a threatening place, at least on a social level? Or was I creating it that way? Why didn’t everyone tense in the presence of authorities? Why didn’t other people panic when they had to give their name, or when they had to speak on the telephone to strangers? How was I managing to frame the world in such a negative way? I eventually discovered that when I blocked, I did so to prevent myself from experiencing things I didn’t want to experience. But if it was I who created my speech blocks, then I needed to understand why I held myself back and blocked. What was I afraid of? What didn’t I want to see? What might happen if I let go? And how could I make my world less threatening? There were two books back in the early 60s that provided me with a novel way to approach these issues. Both had to do with the running of my mind. The first was a book called Psycho-Cybernetics by a plastic surgeon named Maxwell Maltz. Maltz makes a compelling case for the fact that your unconscious mind accomplishes whatever your conscious mind puts before it – similar to the way a technician programs a computer. He points out that when confronting a performance fear – such as whether you can make the two-foot putt that wins the golf tournament – if you mentally image only what you’re afraid might happen, you’ll probably miss the putt. You need to focus all your attention on the desired positive outcome. The problem is, my mind is also programmed to keep me safe by focusing on any imminent danger, such as the black widow spider on the ceiling or the footsteps behind me as I walk alone at night down a dark street. Not to think about the danger is counter-intuitive. Yet, I must do just that when dealing with a performance fear such as stuttering. The book offered some simple but compelling rules for how my mind worked. The second book, S. I. Hayakawa’s Language in Thought and Action, was a simplified presentation of general semantics, developed in the 30s by Alfred Korzybski, one of the brilliant minds of the day. General Semantics looks at how our habits of thinking color our experiences, and how the structure of language, itself, forces us to see things in a particular way. Thanks to general semantics, I had a platform from which I could step outside my normal frames of reference and observe and reframe my day-to-day experiences, thus making my world more manageable and less stressful. Now fast forward 35 years. In early 2002 I received an email from Linda Rounds, a 38-year-old human resources director of a company in Indiana whom I had met over the Internet. Linda wrote to tell me that thanks to my book plus several telephone sessions with a remarkable individual named Bobby Bodenhamer, she had abruptly put an end to a lifelong stuttering problem. I quickly got in touch with Bob to find out more. It appeared that Bob was a practitioner and teacher of something called Neuro-Semantics (NS). I discovered that NS is a further development of Neuro-Linguistic Programming (NLP) which, in turn, is a further development of general semantics, the discipline I had found so helpful back in the 60s. Now my interest was really piqued. It was apparent from the first e-mails and later, through several phone conversations that Bob Bodenhamer and I were on the same wavelength. Although he had never stuttered himself, Bob had an intuitive understanding of issues that are central to stuttering. This is in part because neuro-semantics, which Bob teaches, addresses the very challenges that I had wrestled with when I was trying to overcome my own stuttering. I was especially interested in what Bob had to say because, as a person who recovered from stuttering, I have frequently been asked how I got over it. After I tell my story, people naturally ask what they can do to follow in the same path. Until very recently, I didn’t have much to offer when it came to the mind management aspect of stuttering. Maltz’s book is still relevant in a general way, but many people want guidance on specific steps they can take to address their blocking. And general semantics, though still valid in its precepts, also does not directly offer specific approaches and exercises on how to address the issues associated with stuttering. 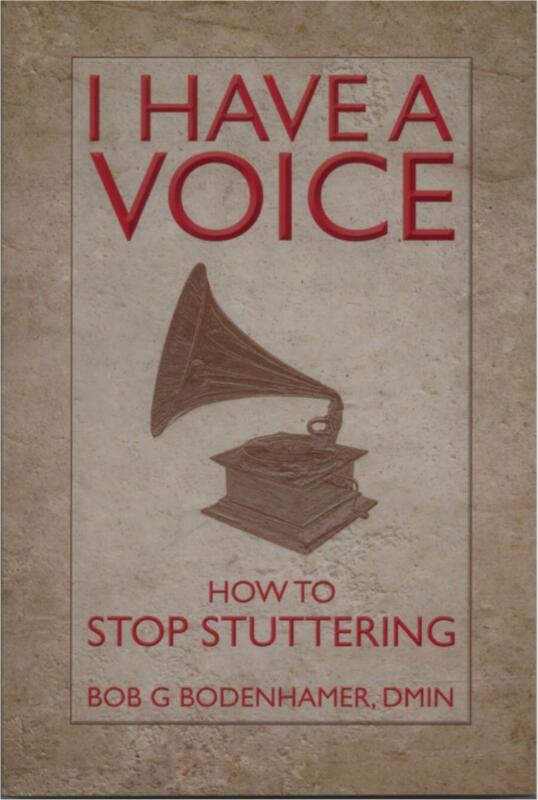 All that has changed with the publication of Mastering Blocking and Stuttering: A Handbook for Gaining Fluency. Mastering Blocking and Stuttering is a compendium of concepts and tools that use the principles of neuro-semantics to reframe the mindset that leads to speech blocks. Several groups of people will directly benefit from this book. Therapists and speech-language pathologists who work with those who stutter will find the various neuro-semantic processes and tools extremely helpful. As a practitioner, you’ll not only have resources for addressing the physical behaviors of your clients that are counter-productive to fluent speech, but for the first time, you’ll have tools for addressing the habits of thought that shape their negative mind state. This is a major resource that has been lacking in the therapist’s toolkit. Processes such as those for redefining self, altering states, reframing the meaning of stuttering, and remodeling behavior will now allow you to follow a multi-dimensional approach. If you’re someone who stutters and are motivated to experiment with and explore your own stuttering, you’ll also find this book a great resource. You’ll acquire workable tools for modifying your mind and emotional states. This, in turn, will help you to counter the feelings of helplessness which are so disempowering and which can make speaking such a troubling experience. Enterprising individuals who wish to run their own self-therapy program using neuro-semantics resources can be reassured they do not have to go it alone. Thanks to Linda Rounds, who serves as moderator, there is an Internet discussion group on Yahoo where you can share your personal experiences using the principles and precepts described in this book. If you want to participate, you can register at http://groups.yahoo.com/group/neurosemanticsofstuttering. You will also have an opportunity to participate in some of the most intelligent discussions of stuttering-related issues found anywhere on the Internet. Finally, a few observations about the word “stuttering.” Although stuttering is a commonly used word, it unfortunately contributes to the confusion because “stuttering” means too many different things. People who have advanced cases of Parkinsons and who talk in a halting or jerky manner are often referred to as stuttering. Young children who find themselves linguistically over their head might be labeled as stuttering, even though their speech may be effortless and without any attendant struggle behavior. Anyone who finds himself upset, confused, uncertain, embarrassed or discombobulated may also have stretches of dysfluency, even though it is totally unself-conscious. I call this bobulating to distinguish this form of dysfluency from that in which the individual is momentarily blocked and unable to say a word. Then there is blocking. Without a speech block, there will be no helplessness, frustration, embarrassment, and feelings of disempowerment. The speech block sits at the center of the problem and should not be confused with other kinds of dysfluency. For reasons of clarity, we encourage people to use the word “blocking” when talking about their speech difficulties. But many remain wedded to the word “stuttering” and are not apt to easily give it up. This is understandable. It’s a familiar and commonly used word, and old habits die hard. Consequently, throughout this book, you will see references to the compound word “blocking/stuttering” to distinguish this kind of dysfluency from more general and non-disabling garden varieties of stuttering. A word about the book as a whole. You are not encouraged consume it in one or two sittings. There is too much to think about and too many different processes to absorb in a short time. Rather, it is a reference book rich in understanding and chock full of tools and techniques that can help you get to the heart of you or your client’s blocking behaviors and issues. So sip it a bit at a time, live with the information, try out the processes with your clients or with yourself, and if you’re someone who stutters, share your thoughts and experiences on the Yahoo group with others of like mind. Remember that blocking/stuttering is a complex system, and while a person’s speech habits substantially contribute to their blocking, their world their view and their habits of thought and perception are likely to be major contributors to the stuttering system and also need to be addressed. Finally, be prepared for a series of “ah-hah” experiences as you explore blocking/stuttering in a new light and make powerful discoveries about the nature of stuttering and what it takes to recover. John C. Harrison showed a marked dysfluency at the age of three and two years later underwent limited therapy. But these efforts were unsuccessful and he ultimately struggled with stuttering throughout college and well into adulthood. Then, in his 20s he immersed himself in a broad variety of personal growth programs, which gave him a unique insight into the nature and dynamics of the stuttering person. As a result, he has been fully recovered for the last 35 years and no longer deals with a stuttering problem. One of the earliest members of the National Stuttering Association, Harrison was an 18-year member of the Board of Directors and spent nine years as the editor of Letting GO, the NSA’s monthly newsletter. He has run workshops for the stuttering and the professional communities across the U.S. and Canada as well as in Ireland, the U.K., and Australia. He has been published in Advance Magazine and the Journal of Fluency Disorders and has presented at conventions of the American Speech Language Hearing Association and the California Speech Language Hearing Association, as well as at the First World Congress on Fluency Disorders in Munich, Germany. Harrison lives with his wife in San Francisco where he works as a presentation coach, speaker, and freelance writer. He also coaches people by phone on how to investigate, understand and transform the system that creates and maintains their stuttering system. I did not plan to work with people who block and stutter. Indeed, it happened quite by accident. Some years ago, a sales seminar participant asked me if I could help people who stutter. I told him that I didn’t know, but I sure would be glad to give it a try. His son, Charles, then twenty-five, came in for a two hour session. After one hour’s work we discovered that behind his blocking and stuttering were some fears of speaking that were rooted in childhood. Once he realized that he was mentally causing the stutter, he thanked me, paid me and left. And as far as I know, he gained complete fluency. The key for him was understanding that he was creating the stuttering, that it was neither something physical nor out of his control. I have been working as a practitioner of Neuro-Linguistic Programming (NLP) since 1990. A major component of my work has been in dealing with fears, anxiety and phobias. Over those 14 years I have worked with hundreds of clients – approximately three thousand hours of therapy. NLP offers a model for understanding and for changing the way someone makes meaning of their experience, based on how they perceive their world in terms of language, thoughts, states and behaviors. NLP offers effective techniques which can be used widely: in therapy, sales, management, relationships, and, yes, for dealing with stuttering and much more. You will learn more about how change happens as the book unfolds. Excited about the results with Charles, I wrote up a case study of the therapy and sent it to my colleague Michael Hall. He expanded this case study into an article, “Meta-Stating Stuttering: Approaching Stuttering Using NLP and Neuro-Semantics”. After posting the article, I was contacted by a friend of mine whom I had worked with early in my practice. We had worked on his stuttering years earlier but that hadn’t helped him. After reading the article he called me and asked me if I had learned something new. I told him that I sure had and for him to come on over. Needless to say, I was elated with that outcome. However, the major breakthrough came in the spring of 2002 when Linda Rounds emailed me from Indiana. In her search to overcome her stuttering she had read a work by Anthony Robbins at the recommendation of John Harrison. From Anthony Robbins she learned about NLP, so she searched Amazon.com for NLP books and found the book I co-authored with Michael Hall, The User’s Manual for the Brain. From that she obtained my email address and wrote to ask me if I could assist her. In just a few therapy sessions on the phone and via some emails, Linda gained complete fluency. Wow, was I excited. As a result, Linda and I wrote an article entitled “From Stuttering to Stability: A Case Study.” John Harrison published the article in the National Stuttering Association newsletter, Letting Go. I have included the complete article in Appendix B. Because of this article I have had the opportunity to work with several People Who Stutter (PWS), including the speech pathologist Tim Mackesey, SLP (Speech Language Pathologist). It was somewhat ironic to assist to fluency a speech pathologist who had blocked and stuttered most of his life. Tim is now using my techniques in his own practice near Atlanta, Georgia, working with people who block and stutter. Let me say up front that not everyone has attained fluency but many have. Importantly, out of all the people I have worked with, I am confident that all of them have the capacity to attain fluency eventually, just so long as they continue working on their thinking.